Formulated for sensitive skin - especially babies. Why do babies need sunscreen? Their skin is less mature compared to adults and they have higher surface-area to body-weight ratio. This means that the UV rays can harm them more than adults. They can get sunburn at any time of the day when over-exposed to the sun. They can become seriously ill from exposure to the sun. Their sensitive skin contains less melanin. This is the pigment that gives the hair and eyes their colour and offers natural sun protection. They are more prone to developing allergies. Their skin is more sensitive so they have greater risks of experiencing side effects when exposed to the harmful chemicals in sunscreens. Since babies can sometimes lick their hands and other parts of the body, they have the danger of ingesting the sunscreen. Choose a waterproof sunscreen that is specifically made for babies. Check the ingredients of the sunscreen product before buying it. Make sure that it is made of natural mineral ingredients like titanium dioxide and zinc oxide. These types of hypoallergenic ingredients sit on top of the skin rather than absorbing into it. The label should say broad spectrum. 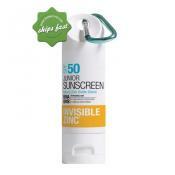 It means that the protection it offers is for both UVA and UVB rays. The SPF should at least be 30 and up to 50 for longer protection. Avoid buying sunscreens that contain insect repellents like DEET as this may be harmful to the baby. What is the proper way of applying sunscreen on babies? Babies under 6 months old have very sensitive skin. It is best to apply very little sunscreen. This means that you only apply on exposed areas. Prioritise the face, ears, nose, neck and hands. And if the feet are exposed, you can also put some on them. For babies 6 months and older, you should apply sunscreen all over, being mindful to reapply every 2 hours. Test first a small amount on the most sensitive part of the babies - under the wrist or behind the ears. Do this for 48 hours. This will ensure that there won't be reaction on the entire body. If there are rashes or any form of irritation, consult your pediatrician. Make sure to apply 30 minutes before sun exposure to ensure that the baby is protected the minute he gets exposed to UV rays. Be very careful when applying on your baby's face. Wait for the right timing, when the baby is no longer squirmy or he's calmer. Avoid the eye and mouth area. Put your baby under a shady tree or structure. If there is no available shade, make your own using either an umbrella or the canopy of his stroller. Invest in clothing with built in sun protection. Put on a wide brim hat that will cover face, ears and neck. If you can, let your baby wear a pair of sunglasses. This will protect their sensitive eyes from the harmful rays of the sun. Put on a sunscreen that is suitable for infants.